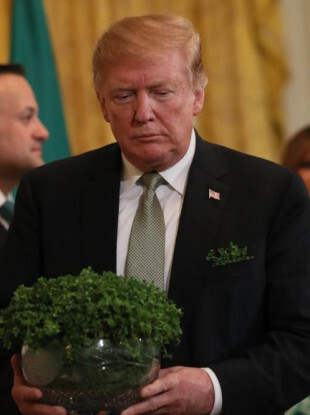 US President Donald Trump with a bowl of shamrock presented by Taoiseach Leo Varadkar at the White House on Thursday. TAOISEACH LEO VARADKAR has said US President Donald Trump could visit Ireland as early as June. Speaking to reporters in Chicago, Varadkar said Trump is due to visit Europe twice in the next year, in June and December, adding that it would make sense for Trump to visit Ireland on one of those trips. The US President was due to visit Dublin and Clare, where he owns a gold resort in Doonbeg, last November but trip was cancelled for “scheduling reasons”. Protests had been planned ahead of that trip and any future visits are also likely to lead to demonstrations against Trump due to controversial comments he has made about topics such as race and gender. We want to know: Are you happy Trump plans to visit Ireland? Email “Poll: Are you happy Trump plans to visit Ireland? ”. Feedback on “Poll: Are you happy Trump plans to visit Ireland? ”.